Creating Careers, the team behind vision2learn for schools, has over 15 years’ experience of delivering exceptionally high quality, nationally recognised, vocational qualifications, through distance and online learning. We are a trusted supplier to thousands of learners in hundreds of secondary schools. But don’t just take our word for it! Please have a read through some of our case studies below to find out what our learners, schools and LAs think of vision2learn for schools. 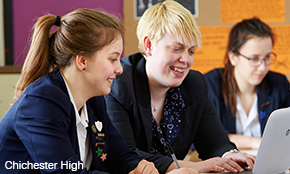 Chichester High School for Girls uses vision2learn for schools as a revision aid for higher attainers and as an intervention tool for lower achievers. 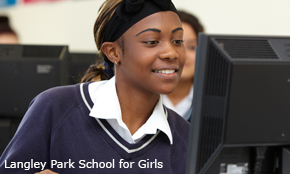 A group of hard-to-reach Year 11 learners at Langley Park School for Girls, Kent, find inspiration studying GCSE Child Development online with vision2learn. Some of the hardest-to-reach Year 11 pupils at Fernhill School, Hampshire, are finding success studying online on vision2learn’s GCSE Leisure and Tourism. The EOTAS PRU in Middlesbrough is improving the performance levels of young people using vision2learn for schools. Introducing online vocational courses has helped a group of boys at the school build their confidence and prepare for their GCSEs. A real pathway to progression. A real opportunity to acquire skills likely to open doors. Helping schools adapt to the changing education landscape. Innovative blended learning approach helps to re-engage vulnerable pupils. E-learning – boosting confidence and improving achievement. The school has transformed achievement. Using e-learning as a valuable addition to the GCSE curriculum.